Portable projectors provide a lot of potential. They can help you erect an enormous display in an instant, ideal for entertainment or educational purposes. Being able to carry them from one location to the next, setting up your screen may only take seconds. At least, when you’re able to find a projector that’s suitable for the kind of environmental play circumstances you have in mind. 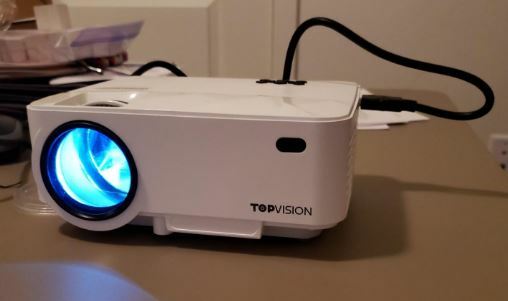 It’s not totally clear why the Topvision 2400Lux Mini Projector is considered a mini projector. Sure, this projector is a bit small. But mini? 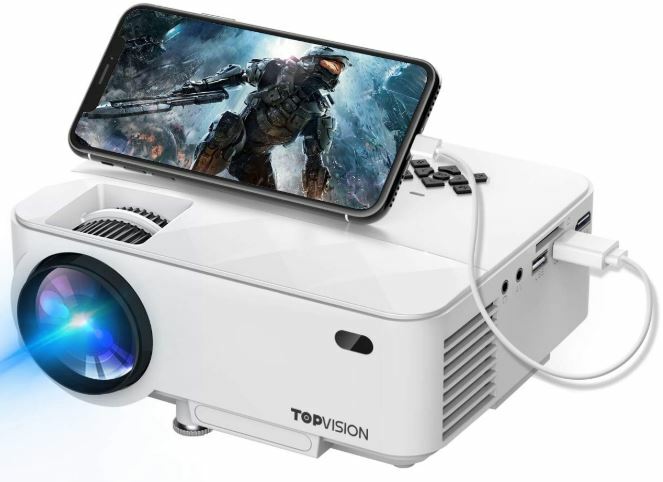 Some projectors are basically the size of a smartphone, and that’s probably what a lot of people are thinking about when they imagine a mini projector. But if you can forgive the Topvision 2400Lux for being a little bulky, you’ll find there are numerous advantages to size. 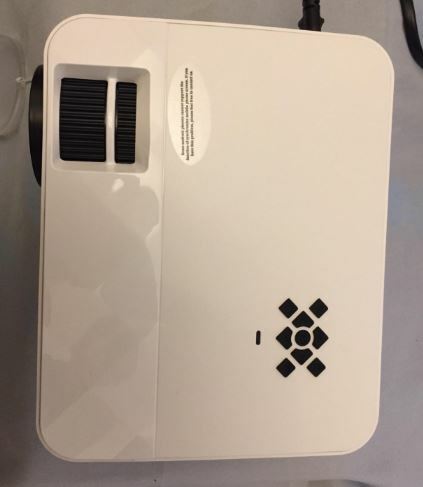 Similar to any good portable projector, the 2400Lux Mini Projector is capable of directly connecting with your devices. It’s also compatible with Amazon Fire, smartphone, USB sticks, and TF cards. The only real limitations that haunt this projector pertain to copyrighted media support, and installation options. When you’re evaluating how it looks playing movies, there’s not much to be displeased about. But even strong projectors have their weak points, you just have to know where to look in order to find them. The Topvision 2400 measures about 7.3 x 5.8 x 2.8 inches, and weighs just over 3lbs. Again, it might be a stretch to call a projector of this size a mini-projector. But it’s certainly a very small projector and still quite portable. You can pretty much hold it in one hand, after all. 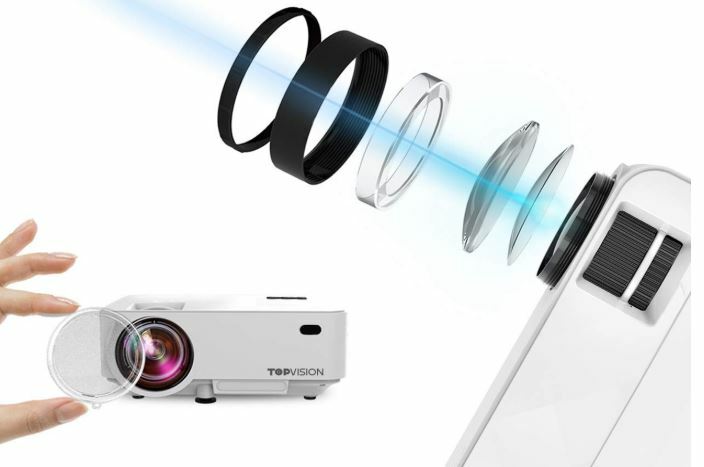 If you don’t have a reason to make your projector as small as a phone, then you’ll find you really should choose the largest portable projector you that’s still small enough for your purposes. In other words, you shouldn’t choose a projector that’s any smaller than necessary because you’ll be paying more to have less. Which makes the 2400Lux a smart choice for someone who really only needs their projector to be reasonably portable, not ultra-portable. From an outward perspective, the Topvision’s white chassis doesn’t look very special. But this projector is pretty reasonably well designed. The body is mostly composed of aluminum, with a few select parts being made from ABS plastic. That helps keep everything pretty lightweight, but weight isn’t the only concern here. Aluminum was selected for its heat dissipation properties. The better you’re able to cool this projector, the longer you can expect the equipment to last. That’s particularly true of the lighting components. Which is why in addition to the aluminum build, there are some pretty powerful fans built inside. Unfortunately, small fans with power have a tendency to create noise problems. But even though these are pretty small fans, noise issues aren’t nearly as bad as you might otherwise expect. Because the Topvision 2400Lux Mini Projector was made with a number of special design elements to specifically to help minimize noise. We’re mostly talking about rubberized grommets and fans that spin a little slower, so the problem isn’t completely gone. There’s still a small hum that comes from the projector, but the hum virtually goes away if you use any of the onboard eco-modes. And it’s pretty much entirely covered by audio, assuming your video has any audio that plays along with it. On the topside of the projector, you’ll a manual keystone correction wheel and a manual focus wheel. Pretty standard stuff for equipment in this price range. You’ll also find nine gray analogue buttons. Unfortunately, these buttons are not at very intuitive. For starters, their labeling isn’t very good. To make things worse, the layout is a bit confusing. At least, at first. But once you realize there are some arrow keys inside of the 9-button layout, it becomes much easier to orient yourself to the interface. Everything becomes a bit easier to understand, but there is a learning curve. And there’s a positive side to having so many different buttons. It’s possible to make virtually every type of adjustment possible directly from the projector. You don’t necessarily need to use a remote to do any of it. But as with any good mini projector, this one does include a remote. 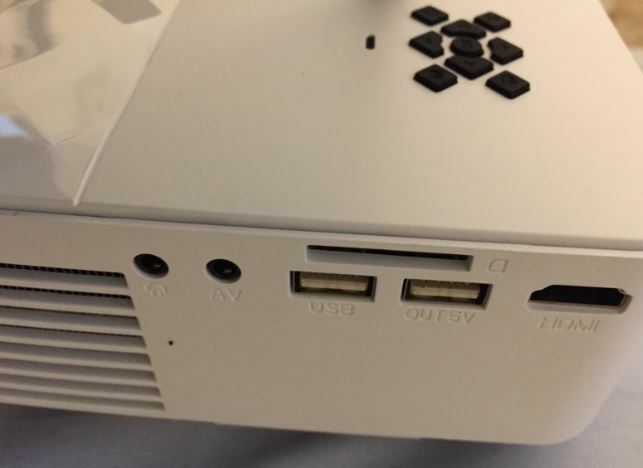 Along the backside of the 2400Lux Mini Projector, you’ll find essentially every sort of video input imaginable. That includes USB-A, HDMI, VGA, IR, AV, support for memory cards, and even a headphone jack. There’s virtually nothing the I/O can’t do for you. The few things that it can’t do are something we’ve yet to touch on, but first we should look at the remote. For a projector like this one, you generally want a simple remote. It’s not only about the remote being user friendly, but being accessible to people who aren’t familiar with the equipment. In this case, you’ll find the Topvision 2400’s remote is beautifully simple. The top side of the remote has only a single red power button. The center of the remote focused around a set of arrow keys encircling an “OK” button. And beneath that, you’ll find some common sense features, like being able to mute the audio or video. Nothing more than what you need, and nothing is poorly labeled. Basically, the remote allows you to do all the same sort of things that are possible with the analogue controls on the projector, but from a distance. However, you will have to dig through a few on-screen menus to get everything done. It’s not much of a hassle to start making color adjustments right from the remote, though. There’s really only one place where the remote drops the ball, and that’s when it comes to batteries. Topvision didn’t include any batteries with this kit, so you’ll have to provide your own pair of AAA. 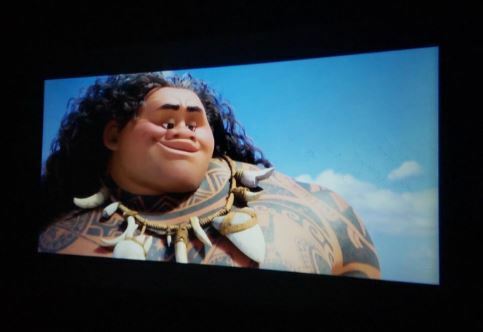 Okay, but how does this projector actually look? True to its name, the Topvision 2400Lux Mini Projector delivers about 2400-lux brightness. That’s quite a bit brighter than the 1800lux projectors which have become so common around this price point. That level of brightness looks especially good when the screen is playing near the lower part of its screen size capacity, which is 50”. It doesn’t perform quite as well when you’re trying to use the maximum display size, which is 176”. For someone who anticipates keeping their display well under 176”, you’ll never experience a real difference in performance based on display size. But if you do plan on running well above 150”, then you’ll want to ensure the environment you’re playing in is well-darkened. Inside a darkened area, you’ll find the contrast ratio is a respectable 2000:1. That’s a solid step over the basic 1000:1 ratio you’ll find is so common among mini projectors. If you’re trying to create a nice cinematic experience, then hitting about 2000:1 is pretty close a comfortable minimum. It’s considerably better than a lot of entry-level PC monitors and entry-level televisions, but it’s still pretty close to average. The TOPVISION 2400Lux Mini Projector runs a slightly wide 16:10 aspect ratio. That’s a consequence of the throw distance for this projector being about 5ft to 17ft. You’ll find the best viewing distances are around 9-feet away from the projector. 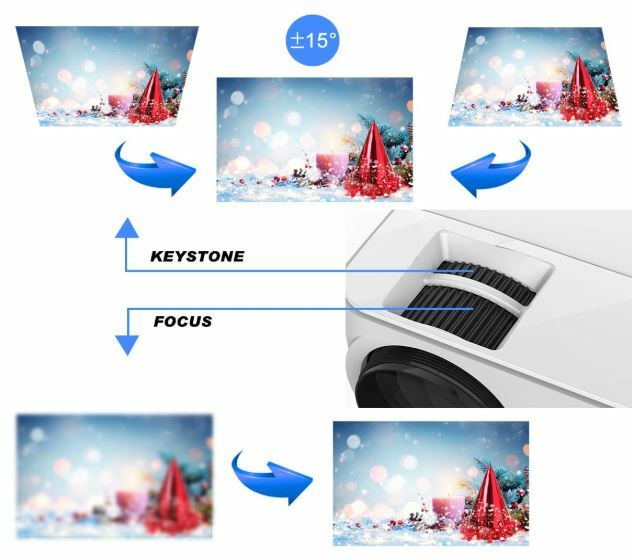 But going outside of that range is still quite possible because this projector provides ±15 degrees of keystone correction. Very useful for widening the variety of installation options at your disposal. For someone considering a ceiling mount or something similar, that can be essential. For someone who anticipates plopping the projector on the ground and shooting their projection upwards, it can be just as important. Pretty handy to have. Shame it’s a manual feature, but that’s something you really can’t avoid without greatly raising your budget. The onboard lighting is expected to last about 50,000 hours. That means you can get about three decades of regular use out of the projector. Though to maintain brightness, you’ll really want to consider changing the bulb after four or five years. Because after a couple years of use, you’ll find the brightness of the bulb will creep down towards that lower 1800 lux point. Fortunately, it’s actually pretty easy to change this bulb, the projector is constructed with a standardized bulb type that’s easy to locate. How can such a great projector be so cheap? 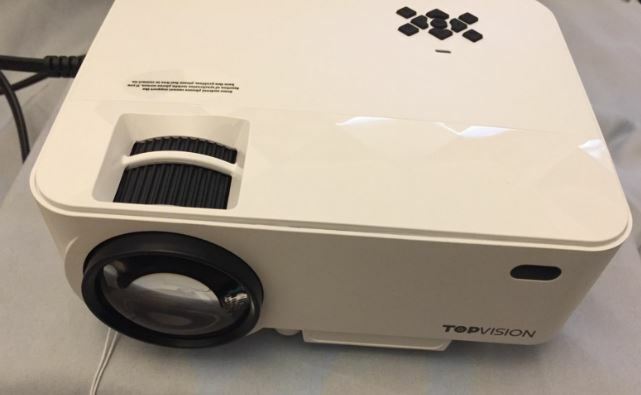 The Topvision 2400Lux Mini Projector has one serious flaw. That flaw is simple – it’s not capable of playing any copyright protected media. That includes Netflix, Hulu, and Amazon Prime Video. 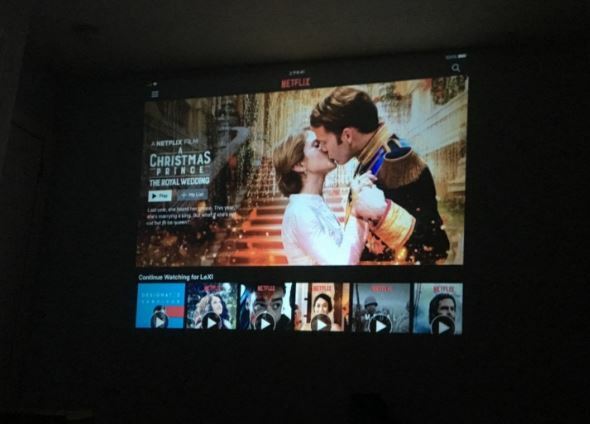 Even if you’re actually paying for a legitimate Netflix subscription, you can’t use this projector to play stuff from your account. Because this projector wasn’t setup to authenticate HDCP. The Topvision 2400 includes the projector, remote control, 3-in-1 AV cable, power cable, HDMI cable, and a user manual. The 3-in-1 AV cable only runs about six inches in length, which is a little constraining. The power cable and HDMI cable are far more accommodating, running closer to 6ft and 4ft respectively. 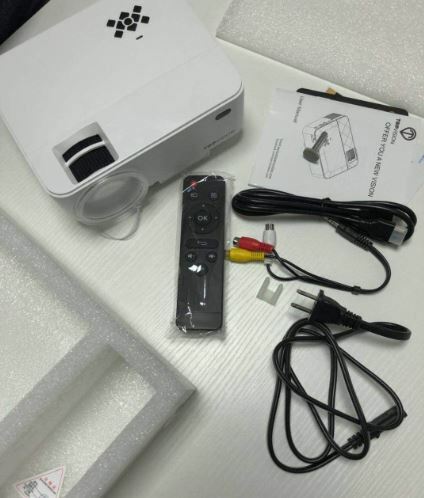 The Topvision 2400Lux Mini Projector includes a two-year warranty, which can be extended a bit further if you decide to register with Topvision. Who Should Choose the TOPVISION 2400Lux Mini Projector? It might be a stretch to call this a mini projector, but it’s terribly portable. The keystone correction ensures you’ve got plenty of positioning potential, too. Whether you’re interested in a permanent installation or something a little more flexible, you’ve got plenty of options at your disposal. In terms of video performance, the contrast ratio is up to snuff for a pretty good home theatre. And the equipment itself is pretty much built to last. However, the TOPVISION 2400 has one serious problem. That problem is that it’s unable to play copyright protected content. Once again, that includes Netflix and other paid streaming services. But this projector works fine for browser content, sites like YouTube, and all other media that wasn’t given special copyright protection software. If you can forgive its limitations, the Topvision 2400Lux Mini Projector is pretty clearly a bargain.